N.B. : this is part of the series of articles of our book titled (Torture and Torment within A Quranist Viewpoint). 1- Egypt has been the most ancient central State in human history; in fact, the existence of Egypt predates the written history of all other civilizations. It is the first State to be conquered and ruled by foreigners; i.e., the Hyksos. Egypt is also the pioneer in forming vast empires, i.e., in the era of Thutmose III, the first conqueror in world history. Historians give Egypt the title (the Mother of world civilization) because it has given the world many things and it has been the pioneer State in almost everything – sadly, this includes tyranny and torture in which the seven-millennia-old Egyptian State specialize and it has taught it to others. Hence, Egypt is the most ancient tyrannical State on the globe and it is considered as a leader in torture, as we infer from the Quran itself, and its culture of tyranny has been there until now; i.e., from the pharaoh named Narmer (or Menes), who unified Upper Egypt and Lower Egypt into one central State more than two millennia B.C., to the current pharaoh; i.e., we mean to refer here to the current President Abdel-Fattah Al-Sisi. Hence, for many centuries, the Egyptian deep-state is based on tyranny, and typically, tyranny has been maintained by means of torture. Egypt is the only State mentioned in the Quran and it still exists while retaining the same features of tyranny and centralism referred to in the Quran verses about Egypt. The Lord God has made Moses' Pharaoh in the Quran an example/leader and warning to all tyrants in all eras anywhere on earth. Middle-Eastern tyrants follow the footsteps of Moses' Pharaoh now, despite the overt claim of their being believers in the Quranic message. In some cases within Egyptian history, enthroned tyrants had a weak character or personality and their affluent retinue members controlled them; yet the deep-state in Egypt controls the Egyptians within oppression, torture, and fear, regardless of the fact that enthroned tyrants were weak or powerful; this applies to all eras in Egypt since the dawn of civilization until now. 2- Tyranny is reinforced by the existence of the River Nile, the backbone of life inside Egypt; it is wrong on the part of some historians to say that Egypt is the gift of the Nile; the Nile passes through other African countries who had no civilizations of any type at all through the previous 7000 years. Egypt is the gift of Egyptians who oppressed others and created a great civilization (whose remains, monuments, artifacts, and ruins astonish tourists, archeologists, historians, and scientists until now) that has given to the whole world the meanings and definitions of religion, conscience, wisdom, morals, etc., that passed to Europe and also elsewhere later on, and this is why Egypt is regarded as the true mother of all world civilization. Egypt is a desert whose River Nile in the its midst makes citizens live on both banks and within its delta, the largest and most fertile delta on planet earth. In order to control such agricultural and irrigational schemes within a feudal system, the pharaohs had to enslave peasants and employ torture and oppression to make people submit to the tyrannical enthroned pharaohs in all eras, as agriculture is the basis of civilization and stability and other activities pertaining to culture. 3- Egypt, with its patient-for-too-long citizens who adhere to peace, and with its civilization, geographical location, wealth, and treasures, has allowed rulers to be tyrannical when they controlled military forces. When such tyrants were weak, tyrants of foreign powers who coveted Egypt had invaded it. Hence, for 7000 years until now, the Egyptians suffered from different types of Egyptian and non-Egyptian tyrannical rulers. In some instances, non-Egyptian tyrannical rulers of Egypt were much better for the Egyptians and for the fame, stature, and authority of Egypt in the region. For instance, the Mameluke sultans in Egypt during the Mameluke Era (1250 – 1517 A.D.), who were originally military slaves, made Egypt reach the summit of wealth and authority as they invaded Sudan, Iraq, and the south of turkey, the Levant, Libya, Hejaz, among other regions. They were more lenient with the Egyptians in comparison to tyrants of the 20th century A.D., though the Mamelukes never knew the culture of human rights known worldwide now – but not applied in Egypt until now. The Egyptian pharaohs of the 20th and the 21st centuries A.D. consider that the Egyptian citizens do not deserve the culture of human rights. The Egyptian tyranny since the 1952 military coup that turned Egypt from a monarchy into a republic made the military leaders who confiscate and monopolize arms/weapons and troops oppress and torture the unarmed Egyptian population; many previous presidents (who came from the military armed forces) smuggled immense wealth abroad and they routinely tortured opposition figures in prison. These Egyptian presidents lost many battles (e.g., Sinai was occupied by Israel from 1967 to 1973) and lost many islands in the Red Sea; these presidents prostrated to the Gulf monarchies, especially the cursed KSA, and this has made Egypt lose its leadership, stature, and authority in the Arab region; people in Egypt now fear that the River Nile would dry up one day because of the Ethiopian dam; the military rule established since 1952 has led Egypt to descend into lower layers of failure, tyranny, and shame on all levels. 1- All countries worldwide has prisons; yet, in The Netherland, prisons closed down as there are no longer crimes and criminals. Other West countries have many prisons which imprison criminals whose crimes are proven as per laws issued by parliaments whose members are elected fairly, and laws there apply on everyone equally; no one is above the law; this is the case in Israel; even the wife of Netanyahu has been questioned within investigations related to a corruption case. Those imprisoned ones who are found guilty in courts are not incarcerated as a type of retribution or revenge but to have their behavior reformed/rectified so they may return to the condition of being good, law-abiding citizens when they are released. 2- In contrast, in Egypt and in the other countries of the Muhammadans, tyrannical rulers and their obsequious clergymen assume as if they own stretches of land (and as if they own people living on them!) inside a given country; i.e., they follow the footsteps of Moses' Pharaoh who proclaimed he owned Egypt and its rivers: "Pharaoh proclaimed among his people, saying, "O my people, do I not own the Kingdom of Egypt, and these rivers flow beneath me? Do you not see?" (43:51). tyrannical rulers monopolize power, authority, wealth and arms/weapons; their deep-state included the judiciary system and the police or security men who arrest and incarcerate anyone; prisoners were tortured and killed, and they are buried in secret mass graves. Thousands of innocent people/suspects are incarcerated and detained for years without fair trials and without accusations and without proven guilty; this occurs in Egypt and this makes the Egyptian prison (esp. because it is mentioned in the Quran several times) a symbol standing for oppression – until now. 3- It is no longer surprising that the Quran mentions prisons ONLY linked to Egypt in the Quranic stories; prisons in Egypt are linked to torture in the stories of Joseph and Moses, with no difference between (1) the Hyksos king who was not very much respected by his courtiers and retinue members (as shown by their response to his dreams/visions) and (2) Moses' Pharaoh whose courtiers and retinue members totally submitted to him. 4- Within the Quranic story of Joseph, the Potiphar's wife failed to seduce him and she accused him of trying to seduce her and advise her husband to imprison or to torture Joseph: "As they raced towards the door, she tore his shirt from behind. At the door, they ran into her husband. She said, "What is the penalty for him who desired to dishonor your wife, except imprisonment or a painful torment?"" (12:25); prison at the time included humiliation as per words of the threat of the Potiphar's wife to him made before the affluent-class women: "She said, "Here he is, the one you blamed me for. I did try to seduce him, but he resisted. But if he does not do what I tell him to do, he will be imprisoned and will be one of the humiliated."" (12:32). Joseph refused the seduction and sought refuge in the Lord God: "He said, "My Lord, prison is more desirable to me than what they call me to. Unless You turn their scheming away from me, I may yield to them, and become one of the ignorant ones." Thereupon his Lord answered him, and diverted their scheming away from him. He is the Hearer, the Knower." (12:33-34); he was punished for his piety and chastity by being imprisoned: "Then it occurred to them, after they had seen the Signs, to imprison him for a while." (12:35); this took place despite the fact that Joseph's innocence was proven; he was imprisoned as per whims of a high-class woman whose husband had power and authority; this type of injustice occurs in Egypt until now – many innocent ones have been imprisoned because of the unjust ones or even because of belly-dancers. 5- Framing innocent ones was known in prisons during the lifetime of Joseph in Egypt s we infer from the story of two prison-cell inmates; see 12:36-42. We remind readers that Egypt during the lifetime of Joseph was a Hyksos kingdom and not ruled by the pharaohs. The king of the Hyksos was not very much respected and feared by his retinue members and courtiers, as per their response to him showing lack of interest: "The king said, "I see seven fat cows being eaten by seven lean ones, and seven green spikes, and others dried up. O courtiers, explain to me my vision, if you are able to interpret visions." They said, "Jumbles of dreams, and we know nothing of the interpretation of dreams."" (12:43-44). 6- In contrast to the era of the Hyksos, the Ramses dynasty pharaohs in their central military State were more powerful and tyrannical; prisons of Egypt became more frightening and oppressive; God has promised Moses and Aaron protection as both feared the injustice and oppression of Pharaoh who torture and imprison those whom he disliked: "Go to Pharaoh. He has tyrannized. But speak to him nicely. Perhaps he will remember, or have some fear." They said, "Lord, we fear he may persecute us, or become violent." He said, "Do not fear, I am with you, I hear and I see." (20:43-46); "..."We will strengthen your arm with your brother, and We will give you authority, so they will not touch you. By virtue of Our Signs, you and those who follow you will be the triumphant."" (28:35). In fact, Moses' Pharaoh threatened Moses, in the first encounter between both of them, by mentioning the fact that he can imprison him: "He said, "If you accept any god other than me, I will make you a prisoner."" (26:29). This is why we understand Moses' fear of being tortured by being stoned; this means that Egyptians prisons employed torture during the era of Moses' Pharaoh: "I have taken refuge in my Lord and your Lord, lest you stone me. But if you do not believe in me, keep away from me."" (44:20-21). Lastly: we copy below our article titled "A Guide for Those Interested in The Types of Prisons", published previously in Arabic on the 11th of June, 2012. (... title: "", Published in June 11, 2012. 1- In 1988, when we were inside a mosque in Arizona, the USA, the feast known as the Lesser Bairam, which follows Ramadan, drew nearer and a formal invitation was received by us to spend the last night of Ramadan and the three days of the feast as a Muslim preacher in the midst of Muslim prisoners in a prison situated in a city near the American-Mexican borders; we have accepted the invitation wholeheartedly; it was a chance for us to study the other side of American life. 2- We and other American friends reached the gate of the prison and our entry was very easy; it is impossible for prisoners to escape such electronic gates and pass through such guards. The official (Christian) preacher of the prison came to receive us; American democracy entailed that he would serve Muslim prisoners during the Lesser Bairam and to bring them a Muslim preacher (i.e., our person); there were only 15 Muslim prisoners: 3 from Iran, one white American, and the rest are African-Americans. 3- What we have witnessed in such an encounter made us lament the miserable state an despicable conditions of Muslims in their homelands in the Arab world; months ago, we were released from Torah Prison in Cairo, Egypt, as we have been imprisoned because of our books and views; memories of our incarceration haunted us all the time as we felt surprised by the luxurious American prison here and those inmates in it who are OK and enjoying their imprisonment terms. 4- The first thing that surprised us was that all prisoners were treated politely and kindly by wardens; there seemed no difference between officers and inmates; everyone wore whatever clothes they liked and their manners of speaking did not show high or low ranks; luckily, a man whose cultural level astonished us and promised to send us a book to teach us the American accent turned out to be a prisoner; we knew this only by the end of this encounter in this prison; he actually sent this book to us later on as per his promise. At first, we thought this prison was mixed; women were there among the men in this encounter; to our great surprise, these women were among the wardens of the prison; we asked ourselves if this is indeed a prison or a madhouse! 5- We were again haunted by bad memories of our own imprisoned in Egypt; prisoners' souls and bodies were humiliated as if they Egyptian prisoners were sub-humans! 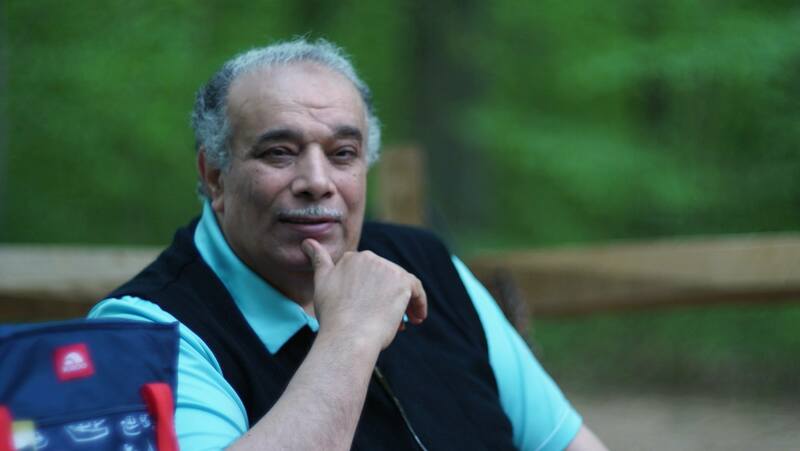 If the Egyptian leader Mustapha Kamel had seen such a luxurious five-star American prison and any Egyptian prison, he'd have thought twice before writing his famous, oft-quoted phrase: (If I were not an Egyptian man, I would wish ardently to become one). 6- When the sunset of the last day of Ramadan ushered the time for the banquet of breaking the fast, the Christian preachers and other wardens served Muslim prisoners the food themselves; the food was very clean, tasty, and served in huge amounts and portions; it is as if we were being served in a five-star hotel! There were faucets to offer milk and soft drinks as per one's desire; we thought at first that we are being shown all this as part of an imperial scheme to brainwash our person to get convinced that the USA is a paradise on earth; we laughed at this thought and brushed it off from our mind as we talked to an Iranian prisoner (who was a high-rank officer in Iran) who was imprisoned for being a spy. This Iranian man told us about the difference between the luxurious American prisons and the terrible Iranian ones of ayatollahs. We remembered how we spend the first two days in the Egyptian prison without drinking water and eating until our lips were dry so as not to be forced to use the stinky, dirty, and unhygienic prison bathroom and to avoid eating beans mixed with worms! By the way, Muslims are divided everywhere even in American prisons; hatred and mistrust were there among the 15 Muslim prisoners: the African-American ones hated the white man and the Iranians hated the African-American ones. This summarizes the cases of division of Muslim when they are grouped elsewhere worldwide. 7- Discussions between ourselves and some wardens made them feel appalled when they knew we have been imprisoned for months in 1987 in Egypt because of our views. They sought to employ us as a Muslim preacher in American prisons; we felt overjoyed by this chance; this did not take place because we were not an American citizen. The American Christian preachers by the end of this encounter asked us about our view of the conditions of Muslim prisoners; we told him in Arabic spontaneously that those who claim that this five-star hotel is a prison deserve severe beating! We translated to him what we said, of course, and he laughed. 8- Before the job offer was withdrawn, we studied the official documents about the mission of preachers in prisons: the main mission is to be keen on maintaining the religious freedom of all prisoners and to respect their holy things and notions (books, icons, prayer rugs, talisman, or even Satanic worship items) and to help them perform any rituals they like and celebrate all religious feasts. We thanked the official who gave us such documents, and the offer did not suit us because it entailed our being an American citizen first, and we expressed to him our admiration for religious freedom in American prisons. 9- Nightmares haunted our mind all the time: what has occurred to Muslims now?! The Quran 1400 years ago precedes everyone and all laws in endorsing religious freedom and in warning against the crime/sin of compulsion in religion and religious persecution; this tolerance drove some nations in the South-Eastern Asian region to embrace Islam willingly without being invaded by Arab troops. Muslims of today are sinking into hellish levels of extremism, fanaticism, bigotry, backwardness, obscurantism, strife, and division. In contrast, the nations of the West have realized the fact that progress is directly linked to religious freedom and freedom of thought. Religion pertains only to God as the Judge of all humanity; homeland is for all citizens equally regardless of their faiths or lack of any faith; all citizens in the West enjoy freedom, equality, equal opportunities, etc., and this is why the West has achieved progress while Arabs remain lagging behind in the darkness of the Middle-Ages until now. 10- The memory of an innocent prisoner with us in Torah Prison in Cairo, Egypt, popped into our mind; he was accused of showing contempt towards Islam and rejecting it because he converted to Christianity; this young man was very much afraid of the extremist Sunnite cell inmates more than the wardens of the prison, as they might have been desirous to kill him based on the Sunnite penalty for apostasy (i.e., to but apostates to death! ); we defended this young many before those who hated his guts inside the prison cell and told them to let him be and to leave him alone; we reminded them of the principle of freedom of religion in the Quran: "There shall be no compulsion in religion; the right way has become distinct from the wrong way..." (2:256); "And say, "The Truth is from your Lord. Whoever wills - let him believe. And whoever wills - let him disbelieve"..." (18:29); "Say, "Believe in it, or do not believe."..." (17:107). We reminded them that God is the One to Judge human beings on the Last Day based on this freedom; no one is to persecute this young man; otherwise, these persecutors will commit the sin of self-deification; even Muhammad himself was told the following by God: "Had your Lord willed, everyone on earth would have believed. Will you compel people to become believers?" (10:99); God told Muhammad to announce the following: "Say, "O people, the truth has come to you from your Lord. Whoever accepts guidance is guided for his own soul; and whoever strays only strays to its detriment. I am not a guardian over you."" (10:108). As always, God says nothing but the Absolute Truth. This article was originally published, in print, on 21st of Oct., 1991, in the Egyptian Cairo-based independent newspaper (Al-Ahrar), now, as we copy this article in our website here in 2012, the Wahabi religious fanaticism and extremism dominate Egypt and the cursed terrorist MB members and Salafists desire now to legalize and normalize this fanaticism and extremism in the Egyptian Law and Egyptian Constitution! If this occurs, Egypt will collapse and be ruined forever, and it will be removed from the world-map! ).